Guillermo Church. 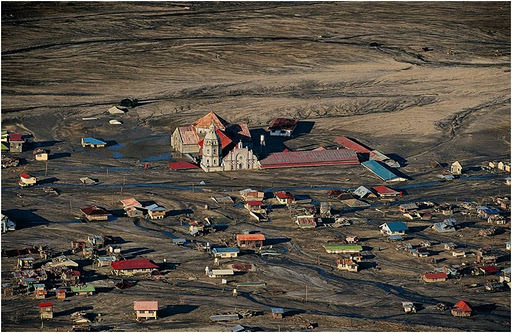 Not a recent picture, but a really good one that shows what lahar can do to the countryside and whole villages. Look how deeply the church is buried! The townspeople excavated the altar and the retablo after the volcanic eruption and relocated it under the dome in order for the wooden retablo to fit. And clean up and other repairs were done, of course, but the main church still remains half-buried in the ground. IF I had pictures you could see the main entrance to the church is now through the first story windows and the altar now sits under the eaves. The congregation sits looking down out of half buried windows, and bats fly occassionaly around the altar. (I saw a colony of them nesting high up in the ceiling.) It was literally, bats in the belfry….and very weird too. You can see where the expression came from. Other than these oddities, its business as usual inside the church. Its decorated, clean and cared for. There was a baptism while we were there. Everything is just a little higher than normal.